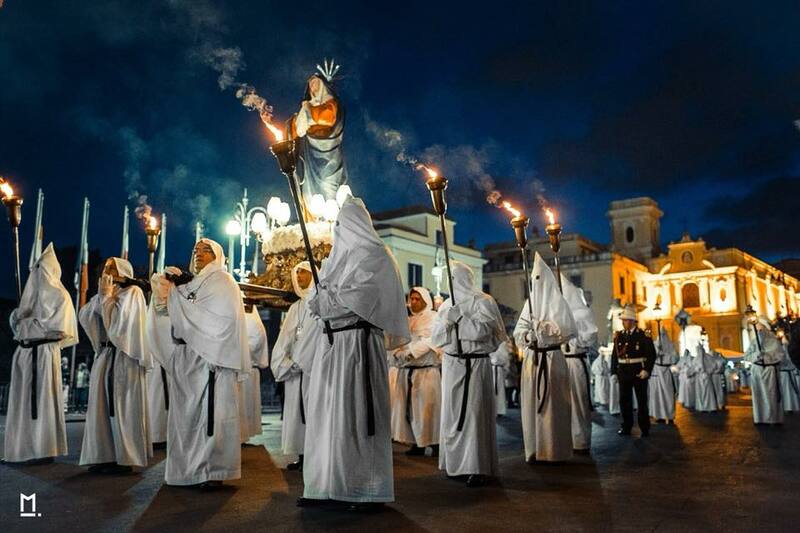 Living the Holy week in Sorrento is really a unique experience: local people of different age and social background intensely live the same common feeling, a manifestation of faith and attachment to one’s own roots. 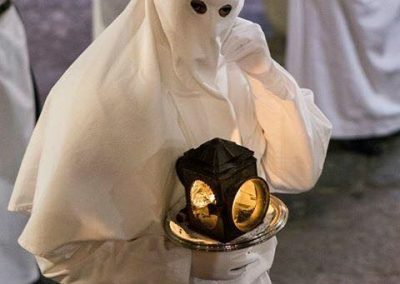 Take a look at the PROGRAM of rituals to learn more about the three processions of Sorrento 2019. 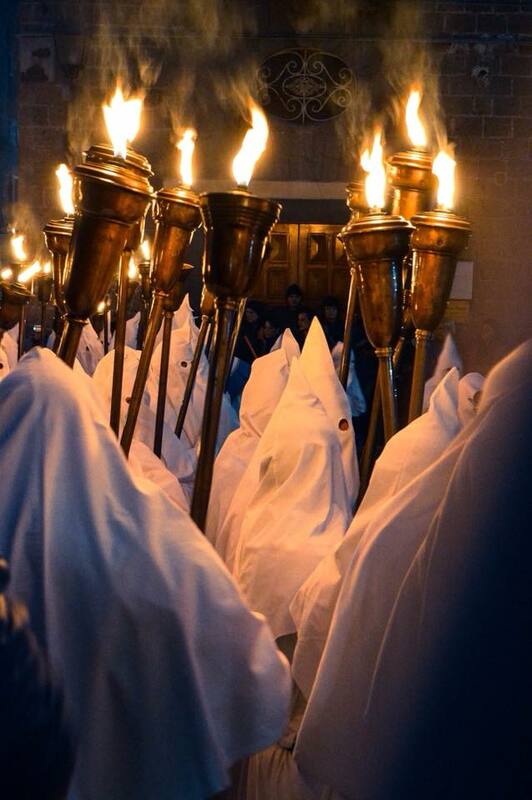 The Good Friday processions; manifestations of penitence and prayer, have their roots back in the 1300’s. A deep and passionate link connects the population of the Peninsula to the processions, marvelously felt and proudly experienced by many generations of Sorrentine families. 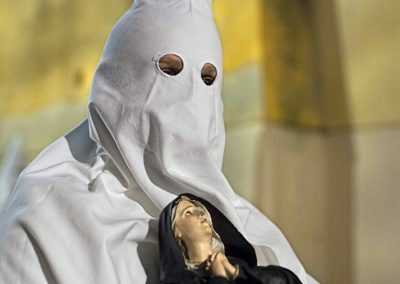 The attachment to religious roots, faith and love for cultural traditions are renewed year after year during the Holy Week with dedication, memory and a strong passion. 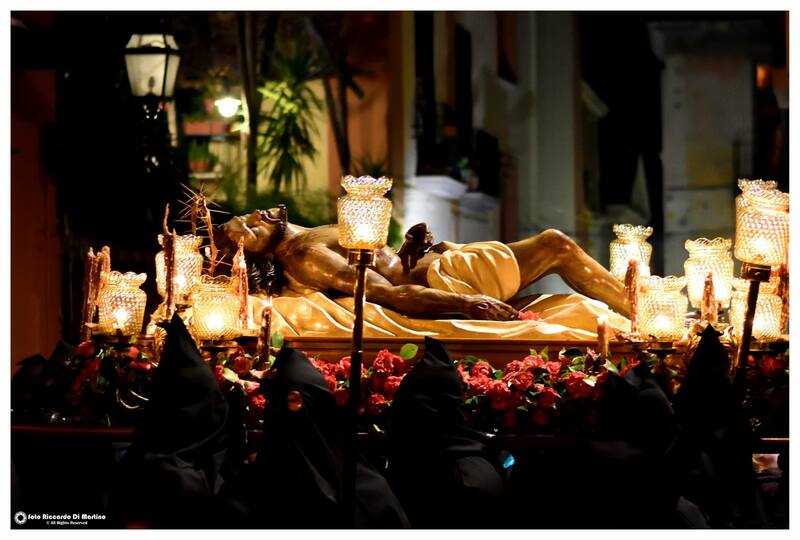 The first Procession begins on Thursday evening and is organized by the Venerable Archconfraternity of the SS. Rosario, whose confreres visit the various Altars of the Reposition (commonly known as “The Sepulchres”) in the main Sorrento Churches. 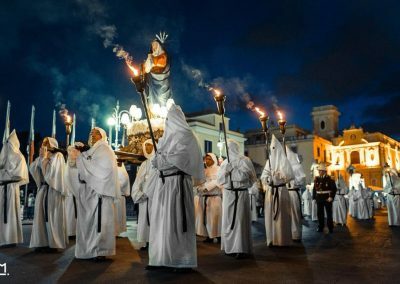 The Good Friday procession takes place a few hours after the stroke of midnight until the first light of dawn, in a charming and fascinating atmosphere. 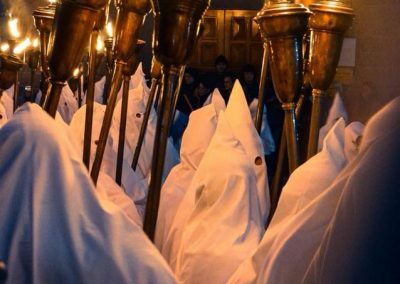 Known commonly as the White procession, due to the white color of the robes, it starts from the Church of the Annunciation of Sorrento and walks through the still deserted streets of the historical centre. 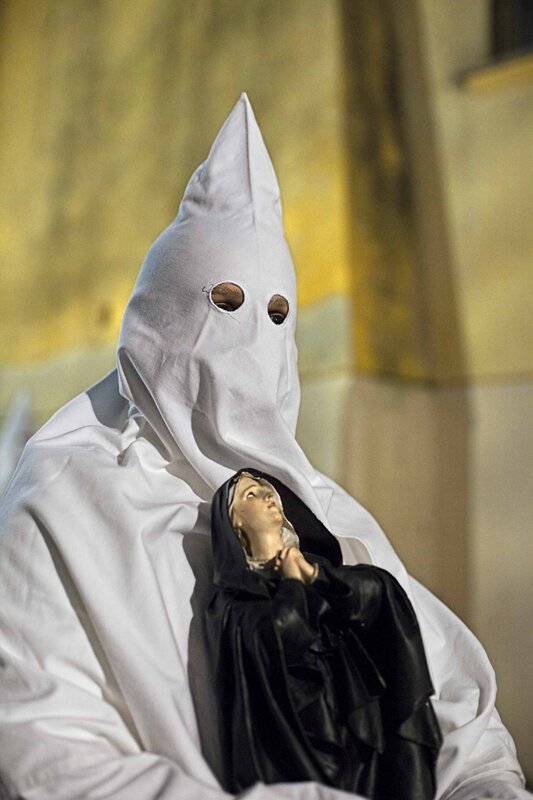 According to popular belief, the penitents accompany Holy Mary in her painful journey in search of her son Jesus, condemned to death and crucifixion. In addition to the statue of Holy Mary, the penitents show some reproductions of the martyrs, aimed at remembering the drama and suffering of Jesus in his course of Passion. 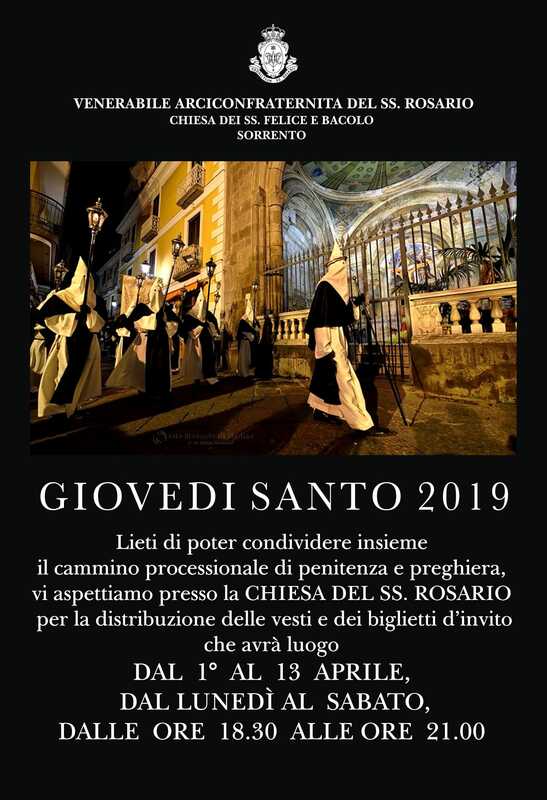 The path of prayer and reflection of the night continues until the evening on Good Friday: just after sunset, from the marble staircase of the Archconfraternity of San Catello, the black hooded penitents get ready for the oldest and most felt processions of the Sorrentine community. 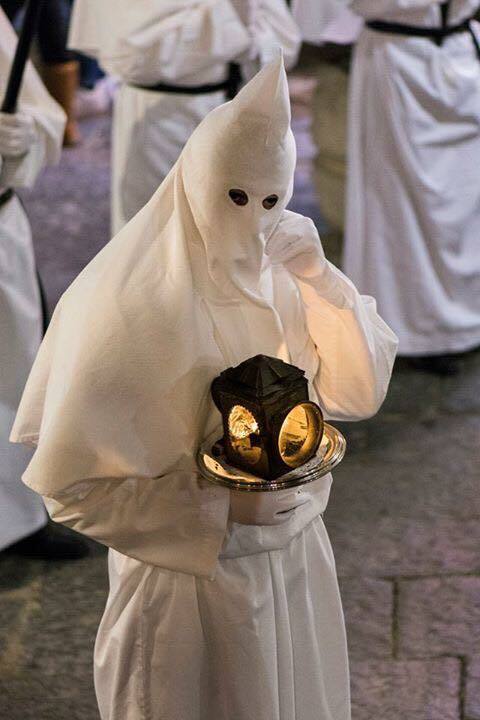 As with the white procession, the black one is accompanied by the touching song of the “Miserere” and by the many martyrs who represent the objects of pain and suffering that characterized the last moments of the life of Jesus Christ. In an emotional and evocative atmosphere, where the lights of the city are extinguished and the only flashes are the torches and the lamps that guide the penitents, you will be impressed by the beauty of the statue of Our Lady and the simulacrum of Jesus Christ that, according to a popular legend, was carved by a noble knight who obtained the right of asylum in the Church of San Catello.